Coppélia is an awe-inspiring debut for The Feathers of Daedalus Circus. Conceptually excellent, this production is limitless in ambition and fantastically executed. Combining flawless dance with film, spoken word and music, this freshly original show is a joy to watch, and promises great things to come for this young, creative company. At the core of Coppélia is a conflict between a constructed, non-living thing and real flesh and blood; an ‘ideal woman’ who is not a woman, but who lures with all the trappings of a female form. Smooth, painted wood lasts a lifetime without decaying or dying, whereas the reality of human love is far more unwieldy and unpredictable, shared as it is between perishable beings. 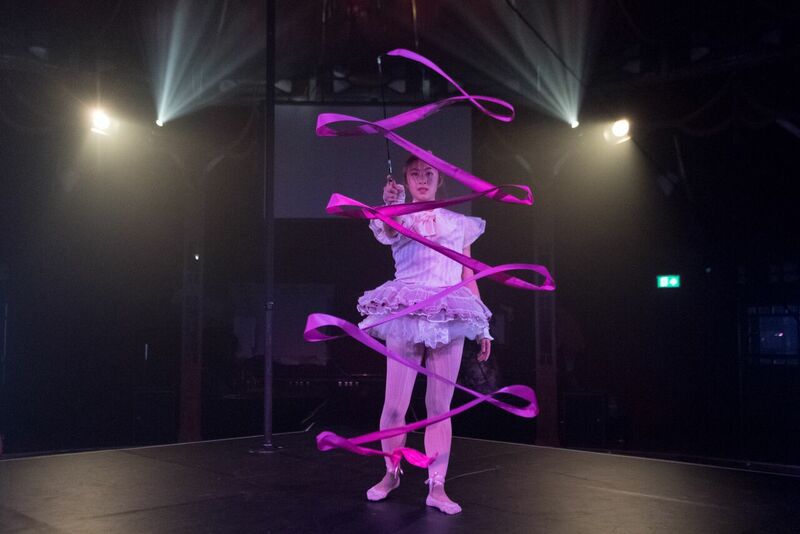 But watching these dancers whirl and weave dreams around the kaleidoscopic circus space, I was enraptured and invigorated by the wonderful potential of the human body. All moved with epic strength, grace and unbelievable ease, revealing not only of very special talent, but of admirable levels of hard work. Coppélia used the stage sensitively and thoroughly, exploring all levels of the space. Choreography was inventive, blurring ballet and angular modern dance. From the troupe of Dancers’ slick, synchronised floorwork, to Tessa Blackman as Coppélia’s stunning performance on the aerial troop trapeze and Peter Shirley as Franz’s masterful sequences in the spinning Cyr wheel, I was spellbound; entranced like Franz and unwilling to leave this circus fantasy. Structurally, the piece was tight, clear and very well-paced. Every action furthered the story with deliberation and an impressive lightness of touch. Recorded spoken-word poetry, eloquently composed by Sophie Leseberg Smith, voiced the characters’ thoughts, adding layers to the story and charging each dance with motive and emotion. Joanna Vymeris, Daphne Chia and Sharla Pettersen accurately and harmoniously synchronised their movements to the poems’ pulse. The themes of the story were confidently conveyed: power, love, gender, desire, all playing tumultuously in the innovative duets between characters. Particularly transcendent were Dr Coppélias, danced by Josh Frazer, and his creation, conveying their fervent power dynamic with muscular beauty and tangible fire. At points, Coppélia would mouth the lyrics to songs accompanying her, further accenting the power-play. Gabbie Cook communicated so much with her gaze, and her acrobatic pole work was both nimble and elegant. Her first dance with Franz, playfully performed to upbeat 1920s jazz, hauntingly juxtaposed their later pair dance, when Franz is under Coppélia’s spell. Even when executing very challenging physical feats, there was not a furrowed brow to be seen, only utter connection to the story and an evident investment in its trajectory. This production was attentive to light and shade, and the three Dancers guided the audience through every nook and cranny of this mysterious world. Music varied from synth-dub tracks, apt for these mechanised dolls, to Leonard Cohen, to Mozart. This variety made Coppélia bravely unique, but the choices were occasionally jarring. When Swanhilda breaks into Dr Coppélias’ workshop, for example, music could have been used to raise the stakes more tangibly. Perhaps, instead of fading one track out and the next one in, music could have been interwoven together, like interlinking cogs whirring inside a machine, to make the transitions between each dance a little less abrupt. For the most part, the use of film, projected on three screens, was a pleasing addition to the theatrical events: balletic legs to mirror the Dancers, and a film of Franz, played during a solo piece of Dr Coppélias’, highlighting their clashing energies. But the footage occasionally felt overwhelming, particularly during the exposition of the story, when reams of images distracted from the stage. A little more simplicity would not have gone amiss, to better amalgamate the technical elements of the piece. Coppélia cannot be commended enough for its ingenuity, refreshing and transfixing directorial choices, and top class performances. Bodies moving like clockwork transported all in the tent on a rich, sensory journey. A darkly delectable treat.